Lounging around on safari. All photos by Jordan Siskind-Weiss. Popupla summer intern Jordan Siskind-Weiss spent a fleeting twelve days on safari in Sub-Saharan Africa and barely slept a peep. She was too mesmerized by the wilderness. Back at Popupla HQ, she regaled us with quirky travel tales of adrenaline-pumping activities and pure, untouched savannah. SOUTH AFRICA – American students studying abroad in Cape Town anxiously anticipate mid-semester break more than final exams. Our group of twenty students looked forward to an atypical spring break agenda. We did not load up on sunscreen and new string bikinis for a trip to tropical paradise. We did not purchase excess Tylenol or Aspirin in preparation for the hangovers that would surely lay ahead. Instead, on a chilly September morning, equipped with only the barest of necessities — a water bottle, a sleeping bag, and enough underwear to last about two weeks — we boarded a plane for Johannesburg, for what would be the most memorable travel experience of my life: A rugged safari through Sub-Saharan Africa. In Johannesburg, we were greeted by Shepherd and Robinson, our cook and driver for the next two weeks. We piled into a twenty-person truck, equipped with small lockers in the back to hold our bags and a metal trunk in the front, in which we would later smuggle meat and other "illegal" food products across the border. Who knew that our first day on safari meant ten hours of driving through northern South Africa in an unairconditioned vehicle. My first and only Tweet of the journey, before I lost all cellphone reception: Update: I am getting sunburned sitting on the bus, it feels like it's 115 degrees, and the bus driver is playing the Lion King soundtrack on-loop. Thankfully, our experience improved exponentially after the initial leg of the trip. 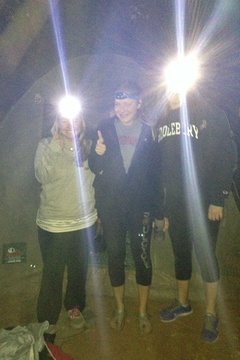 When we arrived at our first campsite, we were given a tutorial, by headlamp, on how to set up our four-person tents. We would eventually get the hang of it, but our first attempt was a painful one. With dim lighting and sharp equipment, many of us were nearly impaled by the hardware. Starving and grimy after our first day on the road, we ate a quick dinner and went in search of showers. We found only outdoor showers, typical of South African campgrounds. The temperature had dropped so significantly at night that most people opted for grime — there was no way they would take off their sweatshirts, let alone stand naked under freezing cold water. I, however, persevered. Whatever fantasies I had about the luxury of outdoor showers soon evaporated. I took the quickest and most unpleasant shower of my life. But it was worth it. I smelled significantly better than anyone else on the bus the following day. After two days of overland travel, we crossed the border from South Africa into Botswana and reached our first real safari destination. 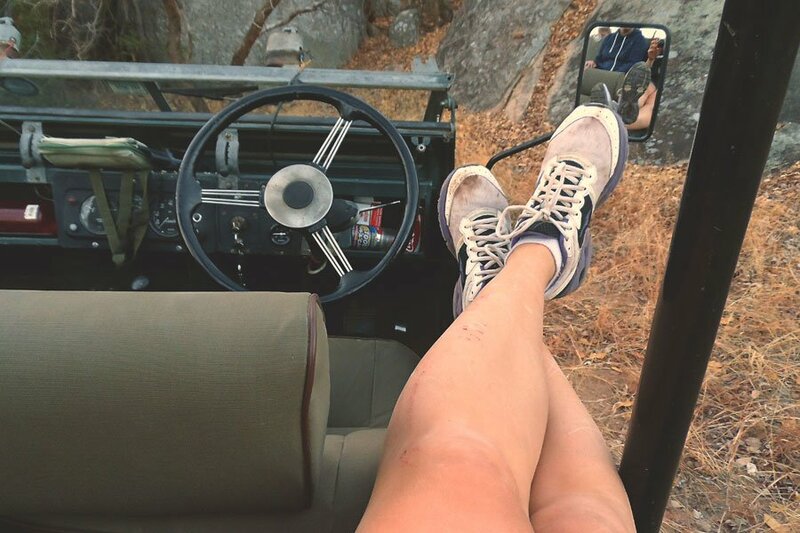 We jumped onto an open-air safari truck and drove for 90 minutes into the bush. What startled me more than the untouched landscape were the few families we passed along the way, all living in thatched roof huts, miles from anything or anyone else. Their ability to sustain themselves entirely off the land, even during the dry season, was simply remarkable. After our early morning drive, we approached floodplains. We had reached the Okavango Delta. We were introduced to a local group of Batswana, who, over the next two days, would paddle us down the Delta in mokoros, traditional boats made from hollowed tree trunks. There were two passengers and one guide per boat. We moved down the Delta as if on Venetian Gondolas (minus the singing, of course). 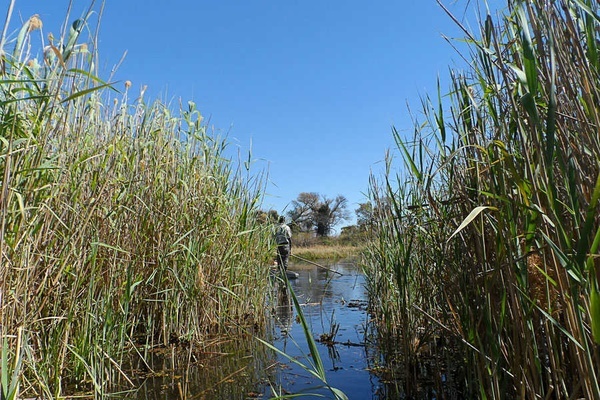 View through the reeds on the Okavango Delta. Gliding down the Okavango Delta was an incredibly peaceful experience. As we floated through narrow passages of the river, all I could hear was the sound of the reeds swaying in the breeze and the trickling of the water as it splashed against the banks. Nobody spoke. I was overcome with the sense that I had been engulfed by the energy of this body of water, by my intimate proximity to nature during those fleeting moments aboard a mokoro. After an hour on the river, we pulled our boats onto a shaded portion of the bank. We set up camp, made lunch, and took a dip in a calm inlet of the Delta. Evening came, and we split up into five groups. My guide, Philip, was in his mid-forties and had lived on the Delta his entire life. Once we introduced ourselves, he made sure that we understood the potential danger of this activity. "You listen everything I say. You no listen, you lose your life." Philip got our attention. We spent the next two hours walking the bush while Philip taught us about every aspect of life in the wild. We stood twenty feet from families of giraffe, zebra, elephant, impala, and wildebeest. Before returning to our campsite, we watched the sun set over the savannah. 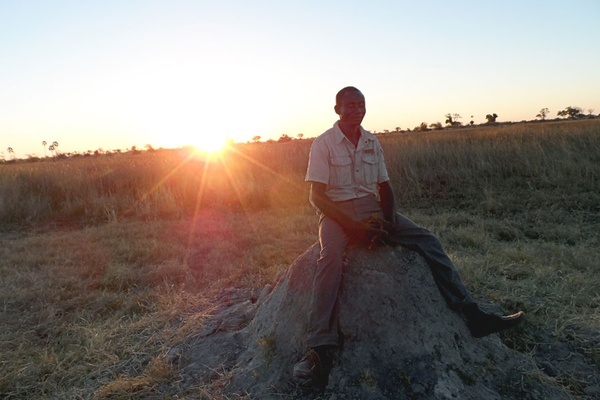 Philip, enjoying the sunset over the savannah. Their song was simple but true. That night I saw the most beautiful stars in existence. We woke early, went on another game walk, and re-traced our paddle strokes on the Delta. It was a bit more challenging heading upstream, which made the second mokoro ride less peaceful than the first. Open-air trucks were waiting for us upstream. Our next stop was a river safari on the Chobe River. For three hours, I felt like I was in Jurassic Park. We saw elephants, hippos, crocodiles, and impala grazing in their natural environment, not paying us any mind. I had never seen so many wild animals in one place. We were overpowered in number and humbled in spirit by this brief insight into the animal kingdom. An incredible sunset met us at the end of our cruise. The sky was illuminated in hues of pink and orange and created a tangible energy that forced everyone to put down their cameras and just take it all in. 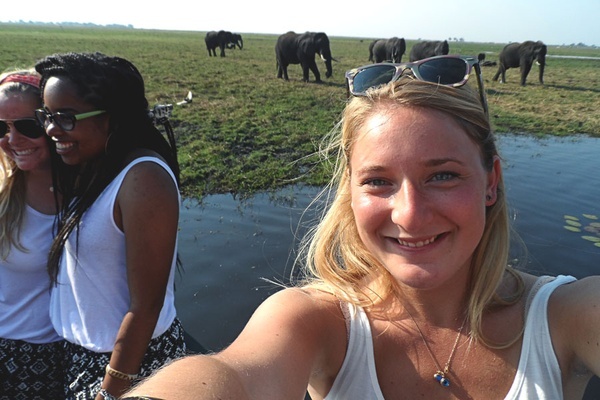 Shameless selfie with a herd of elephants. Last in line, elephant veering from the herd. 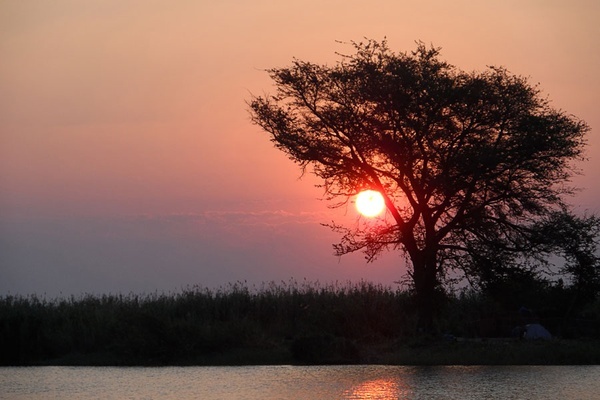 Sunset over the Chobe River. We spent the next three nights at in Victoria Falls, Zimbabwe. I whitewater rafted (read about that fiasco on Popupla), saw the waterfalls, walked with lions (a touristy activity if ever there was one) and crossed the border into Zambia to swim in Devil's Pool. Devil's Pool is anything but secure, but at this point in the trip, I was on a roll. There was no way I was going to miss an exhilarating experience. 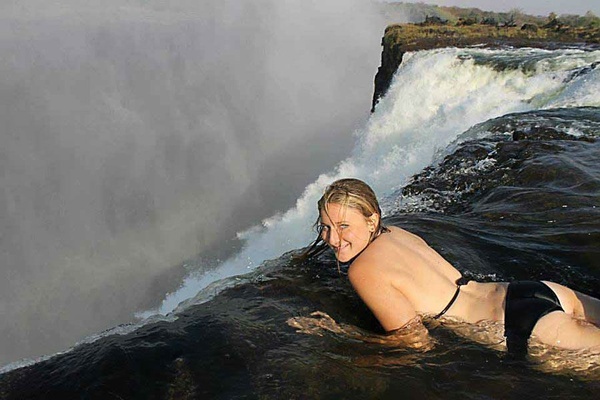 The pool is positioned like an "armchair" on the falls, a few feet above where water drops off and plunges into the Zambezi. During the dry season, when the water line is low enough, you can lie in the armchair (with someone faithfully holding on to your ankles) and peak your head over the side of the falls. By the time we got to Livingstone Island, a small landmass close to the falls, I was petrified by the height, power, and sound of the falls. I was the last one in, but I did it — horrified and thrilled all at once. 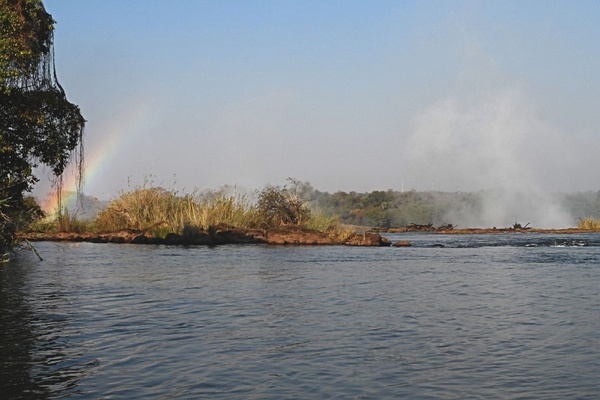 Rainbow leading to Victoria Falls. Jordan hanging on to Devil's Armchair. After a three-day whirlwind in Victoria Falls, it was time to head south. We drove for a full day, through Bulawayo, stopping only in Harare, until we arrived in Rhodes Matopus National Park. 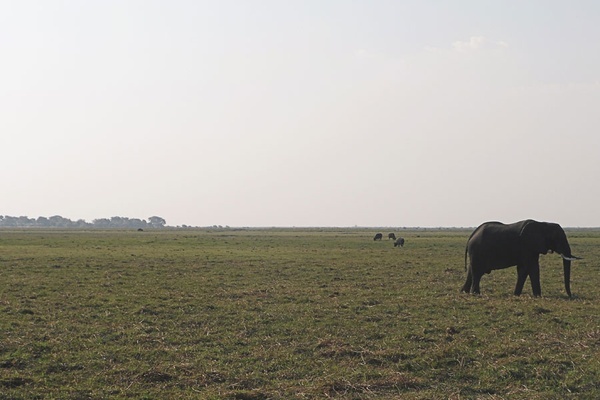 We hoped to spot white rhinos, a species that is rapidly nearing extinction. Our guide, a Zimbabwean named Ian, grew up in the park and told us that to him, each of the rhinos is like a family member. We drove for two hours before finally spotting the elusive animal. 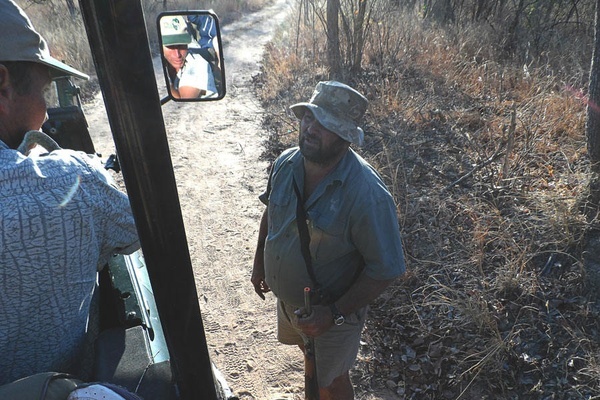 Safari guides, determined to spot rhinos. Matopus was the last major stop on our safari adventure. It took us a full day to reach Johannesburg by car. Most travel guides suggest flying from one location to the next on safari. They say there's nothing to see in between destinations and it's simply a waste of time. I disagree! It may not be time-efficient, but the journey itself is an experience.